Over 26 years of hard work and research of the Mustang GT/CS has been culminated into one complete book--that's raised awareness of this unique Mustang marque throughout the world. Now, newly released, the 50th Anniversary Commemorative Edition is available and Marti Auto Works has a limited supply of this exclusive offer! You may wish to buy a second "investment copy", which will certainly gain in value over time (likely to be found on internet auction sites at much higher prices once they're quickly out of print). 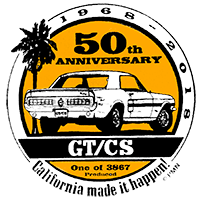 This book will most likely increase the value of your GT/CS, since automotive values are measured by their heritage, history, restoration and recognition--especially with GT/CS Mustang's 50th Year Celebration beginning in 2018! GT/CS owners have been surrounded at car shows and "disruptions" that have happened at Mustang Club meetings when owners bring this book along with their GT/CS. The original Mustang GT/CS (California Special) - Recognition Guide and Owner's Manual.